You'll be £14.99 closer to your next £10.00 credit when you purchase Tracing Your Manchester and Salford Ancestors. What's this? Order within the next 37 minutes to get your order processed the next working day! The book is ideal not just for tracing ancestors, but for anyone researching local history. It is very well organised and even has a section on interesting places to visit. It is easy to use and goes into detail, for example, explaining old-style dates and measurement. There are many good references, including websites and a good directory at the rear. 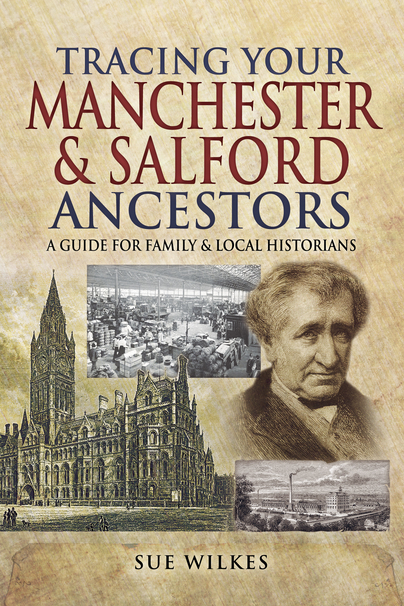 It fills a gap as a useful resource on Salford family and local history and I can thoroughly recommend it. A very useful book that I will refer regularly. Each chapter ends with recommendations for further reading and the appendices list helpful resources, including a timeline of key dates and places to visit. Author article as featured in, on the industrial revolution and what impact it might have had on your ancestors. Sue Wilkes is an established expert on our industrial heritage and a well-known family historian. She has contributed many articles to history and family history magazines, including BBC Who Do You Think You Are?, BBC History, Discover Your Ancestors, Your Family Tree, and Jane Austen’s Regency World. Sue is the author of eight books: Regency Spies (Pen & Sword, 2015), A Visitor’s Guide to Jane Austen’s England (Pen & Sword, 2014), Tracing Your Ancestors’ Childhood (Pen & Sword, 2013), Tracing Your Lancashire Ancestors (Pen & Sword, 2012), The Children History Forgot (Robert Hale, 2011), Tracing Your Canal Ancestors (Pen & Sword, 2011), Regency Cheshire (Robert Hale, 2009) and Narrow Windows, Narrow Lives: The Industrial Revolution in Lancashire (History Press, 2008).